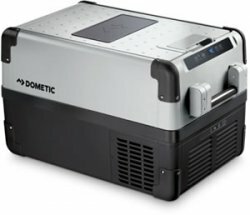 Refrigerate and Deep Freeze on the go with the Dometic CFX-35W. The CFX-35W has an internal capacity of 1.13 cu. ft., fitting 47 cans with height for a Champagne bottle. It has a single-zone temperature compartment can be used as a fridge or a freezer. It includes a basket with removable divider and also features a dairy compartment for storing perishables. Featuring a high-performance compressor and extra-thick insulation, this portable refrigerator freezer is up to 35 % more energy efficient than previous Dometic models. Heavy-duty reinforced corners, stainless-steel hinges and a robust lid coating ensure CFX models will stand-up to extreme conditions.